Fuel oil and natural gas prices have soared over the past several years — and with them so has the popularity of alternative fuels. Wood stove, pellet stove, and fireplace use are all on the rise, and with each of these comes a hidden danger that every dedicated “wood burner” needs to keep in mind. Burning wood creates creosote, which, if left untreated, can cause fires. When a wood fire burns, it releases unburned gases. These unburned gases condensate on the walls of the chimney liner or flue tile and form a tarry or glazed substance called creosote. When allowed to accumulate in the chimney, creosote becomes a fuel source for a potential chimney fire. Creosote build-up can be minimized by burning small hot fires and using dry, well-seasoned wood, but the reality is that creosote formation cannot be avoided. A chimney fire will occur when built-up creosote deposits are ignited by extreme heat from the fireplace. For this to occur, the creosote must be subjected to temperatures over 1,000 degrees Fahrenheit. 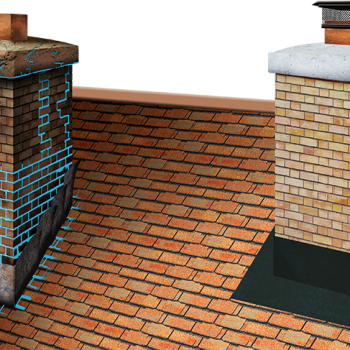 Eventually, every chimney requires a manual cleaning to remove creosote build-up. Since the formation of creosote is an unavoidable by-product of burning wood, cleaning your chimney becomes an unavoidable task as well. Cleaning a chimney on your own is a dirty and difficult job. The proper brushes and techniques should be used to ensure that the sides of the chimney are swept clean of creosote buildup. 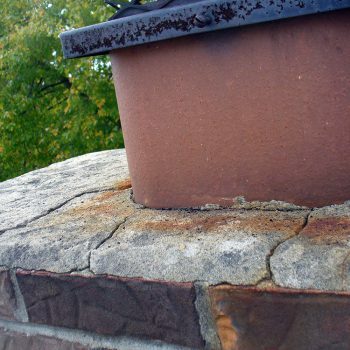 More importantly, proper inspection should be done at every cleaning to ensure that there are no structural defects like cracks or missing mortar joints in the chimney flue that could lead to eventual safety problems. For these reasons we highly recommend that the task of cleaning be left to a CSIA Certified professional chimney sweep. The frequency for the cleanings can vary based on the usage of the fireplace but should never be longer than a year between cleanings. Creosote can begin to reform within a few days after cleaning, so a regular method of ongoing maintenance is always recommended. Once great solution is to use chemical cleaners. Used during burning, chemical cleaners will help to prevent creosote from reforming and will help to reduce chimney odors. These types of cleaners can be found in several different forms, including powders, liquid sprays, logs, and sticks. When selecting a product to use, keep in mind that the best alternative in chemical cleaners is one that can be used on a daily basis with every burn. My experience has been that the liquid sprays, such as Chimney RX Creosote Remover, are the best choice when selecting a cleaner. They tend to be the least expensive per application, are extremely easy-to-use, and since they are used with every burn, are the most effective at reducing ongoing creosote build-up. Burning wood, whether in a fireplace or a wood burning appliance, offers many advantages to the homeowner, including the lure of heating with wood and the joy of stoking the fireplace and tending to the demands of the fire. The energy savings gained fromwood as an alternative fuel source have motivated many homeowners to become “wood burners”. By taking these few steps to keep your fireplace clean from creosote build-up, you will enjoy all of the benefits of natural wood without the risks of fire.